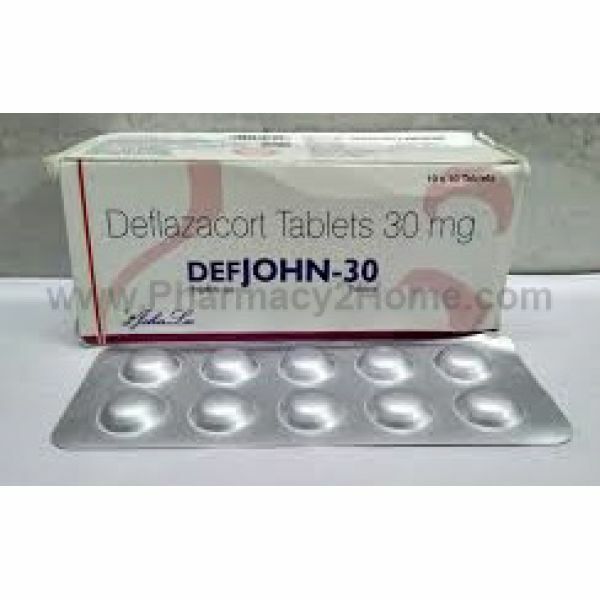 Deflazacort can be used to treat a wide range of allergic and inflammatory diseases including severe asthma and rheumatoid arthritis. It belongs to a group of medicines known as corticosteroids. These are sometimes referred to as "steroids". Certain cells in the body release chemicals that cause inflammation. Deflazacort works by stopping the release of these chemicals, thus reducing inflammation. some cancers (e.g., cancer of the bone marrow) and others. It is contraindicated in those patients who are receiving immunosuppressive therapy or who have active infections or hypersensitivity reaction to this drug. Nausea, abdominal pain or indigestion, Mood or behavior changes, such as nightmares, insomnia, irritability, and suicidal ideation, Fatigue, weakness, skin changes and menstrual cycle changes in women, Dizziness.Long-term use of high doses of Deflazacort can cause "Cushing's syndrome". Others include bone loss or thinning of skin. Excessive growth hair can take place over a longer period. These side effects usually resolve when the treatment is stopped. If you have any other symptom that you think may have been experienced due to this medicine, talk to your doctor or pharmacist.